1 Center post. 1-1/4 in. square by 62 in. 4 Braces. 1-1/4 in. square by 12 in. 16 Horizontal bars. 1 by 1-1/4 by 24 in. 4 Vertical pieces. 1/4 by 1 by 65 in. Attach the four braces for the feet with finishing nails after applying a good coat of glue. The horizontal bars are fastened to the vertical pieces with rivets using washers on both sides. The holes are bored a little large so as to make a slightly loose joint. The other ends of the bars are fastened to the center post with round head screws. 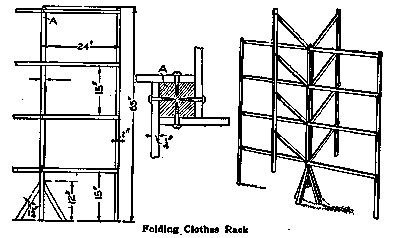 They are fastened, as shown in the cross-section sketch, so it can be folded up. --Contributed by Herman Fosel, Janesville, Wis.